All of these years I have been so grateful for the training I have received first from you personally and then from one of your fabulous teachers. have a link to the beautiful school, that has helped me to make such a good living and helped me to enjoy the work that I do. It’s just simply been amazing! So again, my Gratitude goes out to you more times than you can imagine! I hope that many more people get to enjoy the beautiful training that you provide! I have just completed the certificate course and found it worked in really well with me. I’m a more hands on type of learner, I don’t like alot of paper work and I like things to be short, to the point, and know what I’m doing at the end of it. This course did this. I will be interested in learning more at a later date. I only took the certification course due to other events happening in my life, but I wish I could have taken the diploma course. I’m planning to go back and take the second half at a later date. 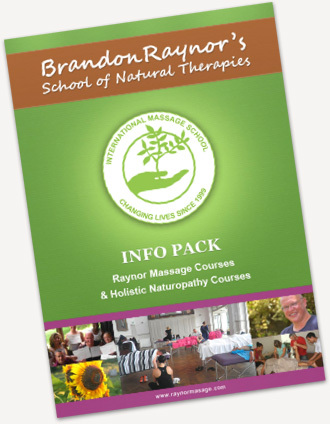 I enjoyed the course – it was a different take on several of the massage courses I had taken in the past. It felt a little like I had culminated much of what I’d learned and managed the Ah-Ha! That is how all this is supposed to fit together! The instruction was excellent, very much focused on the hands-on experience. I have to admit that when I was worked on by Terry, I had the most incredible release in my hips/lower back that I’ve had in years (Thanks Terry!) I now remember how that is supposed to feel! I will be using this technique in my practice henceforth. I really enjoyed learning Raynor massage and it was so enlightening to take a week away from the office and spend time with like-minded people. I only completed the certificate as I couldn’t afford the diploma at the time. I found the course pretty intense and extremely challenging but very rewarding and I hope to attain the full diploma in August, once I have sorted out my finances. Karen was a fantastic teacher and a real inspiration – I hope to be as good a massage therapist as her one day! Now every time I look at a person I envisage getting my hands on their muscles!!! I like Brandon love massages. I too have circumscribed the globe and had varies massages everywhere I can afford them. This Brandon Raynor technique that Terry Masson taught us and gave us was by far the best massage I have ever had!!! Terry allowed each one of us to experience a very deep massage, he was very firm and gentle all at the same time. All eight of us had profound emotional releases!! We were all very amazed of course when it was “Our” turn and we were letting out the sobs and shouts and screams of very very deeply embedded feelings and emotions(many not very pleasant ones). Terry had warned us that we would be very different people after we took the course and in my naiveté though this would be about what we would be learning. He also meant that we would be relieved and lightened of some of the emotional baggage our muscles hold so deeply inside ourselves. The course was fabulous, who knew that I could learn so much in such a short period of time and come out of it a more relaxed and sane. I found the massage course to be very helpful because the tutor showed us what to do and reinforced the lessons with individual instruction. It was a very practical course. Everyone was so positive and willing to learn which made for a great course. Also just as a quick aside, i have, for as long as i can remember, never been able to breathe through the left hand side of my nose. until now ! I thought the hands on approach was confidence inspiring. I enjoyed the course thoroughly. The teacher had a vast knowledge of the subject and beyond. I’d recommend this type of massage to everybody I know. The class was great and I enjoyed it a lot. I am truly honoured to be taught by Brandon. Also it was interesting to meet therapists from all walks of life, everybody was taught by different teachers before the Advanced class. Thank you Brandon for sharing your knowledge with us all. I really enjoyed the courses. Before the course I thought I was relaxed but by the time I had a few massages I learned what true relaxation was. Karen was an excellent teacher.. I felt confident by the time friday came. Thank you Terry, Gynia and Craig, for your caring help and support!